You don't want to miss the breakouts that are taking place in U.S.-listed foreign stocks this fall. As we round out the final week of the month, November is adding up to be a pretty strong month for U.S. stocks. In the 20 days since the presidential election, the "Trump Rally" has pulled the S&P 500 Index 3.3% higher on a total returns basis, pushing the big index to new all-time highs. But don't limit your stock focus stateside. While markets are betting that President-elect Trump will enact policies that favor firms here at home, some foreign stocks that also trade here on U.S. exchanges are actually showing bullish price setups right now. And after prolonged underperformance in ex-U.S. stocks this year, these foreign trades could actually be about to make up for lost time in the final stretch of 2016. To figure out which foreign stocks are worth buying this week, we're turning to the charts for a technical look at five of them that are breaking out. In case you're unfamiliar with technical analysis, here's the executive summary: technical analysis is a way for investors to quantify qualitative factors, such as investor psychology, based on a stock's price action and trends. Once the domain of cloistered trading teams on Wall Street, technicals can help top traders make consistently profitable trades and can aid fundamental investors in better planning their stock execution. 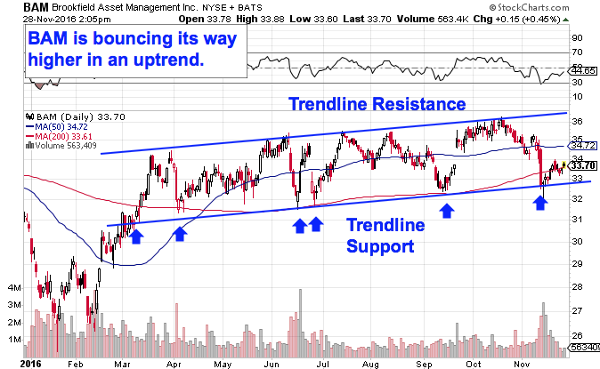 Without further ado, here's a rundown of five technical setups that are showing solid upside potential right now. Up first on our list of overseas breakouts is London-based energy giant BP (BP - Get Report) . BP has been a strong performer all year long, rallying almost 17% year-to-date on a total returns basis thanks to a rebound in energy prices. The good news this fall for BP shareholders is that this big oil and gas company is showing off signs that shares could be in store for a second leg higher from here. BP is forming a long-term ascending triangle pattern, a bullish continuation setup that's formed by horizontal resistance up above shares at $36, and uptrending support to the downside. Put simply, as BP ricochets in between those two technically important price levels, shares have been getting squeezed closer and closer to a breakout through their $36 price ceiling. When that breakout happens, we've got our buy signal. Relative strength, down at the bottom of BP's price chart, provides an additional piece of evidence for the breakout. Our relative strength line, which measures BP's outperformance versus the rest of the broad market, has been in a well-defined uptrend since late April - as long as that uptrend in relative strength remains intact, BP is statistically more likely than not to keep on outperforming. The long-term nature of BP's price setup comes with long-term upside implications once shares crack that $36 price ceiling. We're seeing the exact same price setup in shares of $14.5 billion Peruvian bank Credicorp (BAP - Get Report) . Just like BP, Credicorp has been forming a long-term ascending triangle of its own. And the price pattern is edging closer to breakout territory this week. 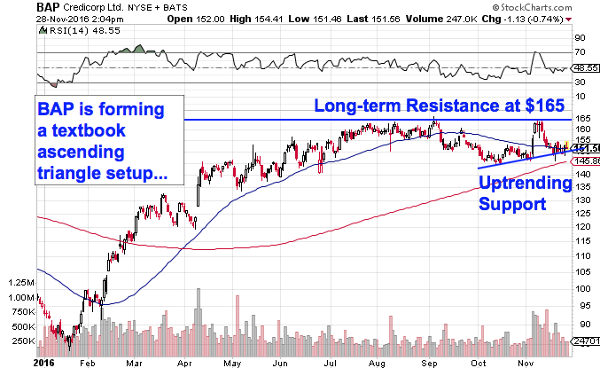 For Credicorp, the key breakout price level to keep an eye on is resistance up at $165. What makes that $165 level so important for Credicorp? It all boils down to buyers and sellers. Price patterns, like this ascending triangle setup, are a good quick way to identify what's going on in the price action, but they're not the bottom-line reason shares are starting to look attractive here. Instead, the "why" comes down to basic supply and demand for BAP's shares themselves. The $165 resistance level is a price where there has been an excess of supply of shares; in other words, it's a spot where sellers have previously been more eager to step in and take gains than buyers have been to buy. That's what makes a breakout above $165 so significant - the move means that buyers are finally strong enough to absorb all of the excess supply above that price level. The 200-day moving average has been acting like a rough proxy for support since October - that makes it a logical place to park a protective stop after $165 gets taken out in Credicorp. Mid-cap Latin American Coca-Cola bottler Embotelladora Andina (AKO.B - Get Report) is another foreign stock that's showing off some major breakout potential this fall. Andina has been a spectacular performer this year, rallying almost 30% higher since the start of January. It's another market-trouncing trade that's signaling the potential for another leg higher in the final months of 2016. 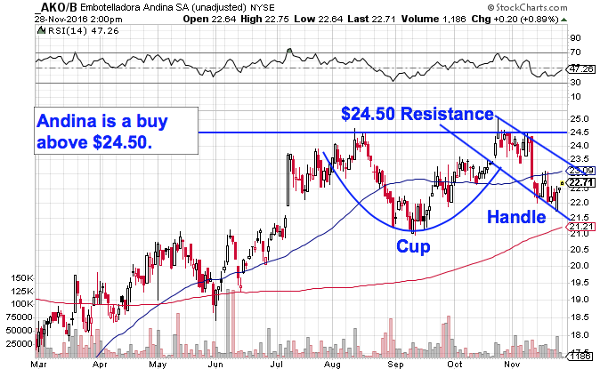 Andina has spent the last few months forming a classic technical price setup called a "cup and handle". The cup and handle is formed by a cup-shaped rounding bottom in shares that's followed up by a short-duration channel down. The buy signal comes on a move through the pattern's price ceiling at $24.50. That $24.50 level has been acting as resistance since August, swatting shares lower on the last three attempts through it - if Andina can break though it on attempt number four, we've got a clear indication that buyers have regained control of shares. Like with any of the other trades on our list today, it's crucial to be reactionary and actually wait for Andina to take out resistance up at $24.50 before clicking "buy". Technical analysis is a risk-management tool, not a crystal ball - that means that this stock doesn't become a high-probability upside trade until $24.50 is in the rearview mirror. Trying to anticipate the breakout could leave you owning a stock that never actually cleared that $24.50 level. It doesn't take an expert trader to decipher the price action in Canada-based alternative asset manager Brookfield Asset Management (BAM - Get Report) . Instead, this $33 billion financial firm has been working its way higher for most of 2016 in a well-defined uptrend that's about as simple as technical price patterns get. More importantly, Brookfield is still a "buy the dips stock" as we inch closer to December. Brookfield's uptrend is formed by a pair of parallel trendlines that have done a good job of defining the trading range for shares to remain stuck in. Along the way, every test of trendline support so far (six of them in total) has provided BAM shareholders with a low-risk, high-reward buying opportunity. Now, as shares bounce off of support in November, it makes sense to pull the trigger on this trend once again. Actually waiting for that bounce is important for two key reasons: it's the spot where shares have the most room to move up before they hit resistance, and it's the spot where the risk is the least (because shares have the least room to move lower before the channel breaks, invalidating the upside trade). Remember, all trend lines do eventually break, but by actually waiting for the bounce to happen first, you're ensuring Brookfield Asset Management can actually still catch a bid along that line before you put your money on shares. While all of the other foreign stocks we've looked at so far have been strong performers this year, China Southern Airlines (ZNH has been anything but. Instead, this $9 billion Chinese air carrier has been selling off in 2016, down more than 25% since the start of the year. But that laggard status in China Southern could be changing; after correcting hard in the last several months, this stock is finally starting to look "bottomy". 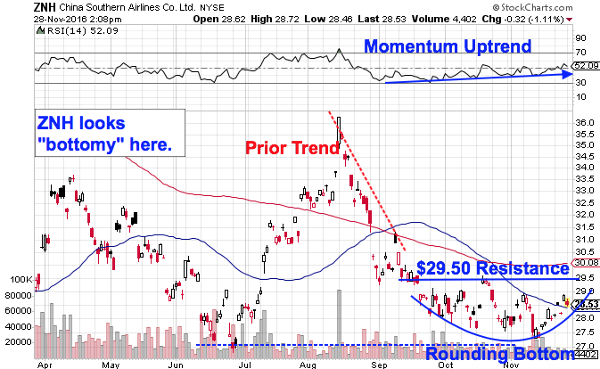 China Southern is currently forming a rounding bottom pattern, a bullish reversal setup that looks just like it sounds. The rounding bottom indicates a gradual shift in control of shares from sellers to buyers, and it triggers a breakout buy signal when the price ceiling that defines the pattern gets taken out. 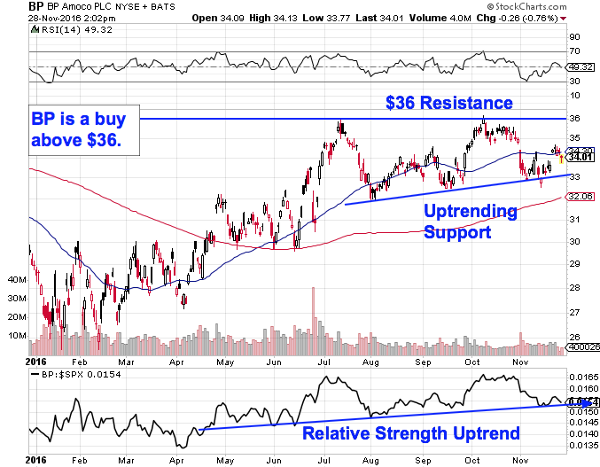 For China Southern, that price ceiling to watch is resistance up at $29.50. Price momentum, measured by 14-day RSI at the top of China Southern's chart, adds some extra evidence that buying pressure is building right now. That's because our momentum gauge has been making a series of higher lows over the course of the rounding bottom pattern, a bullish divergence that's a leading indicator of a change in China Southern's trend. Wait for shares to close above $29.50 before you pull the trigger on this trade.